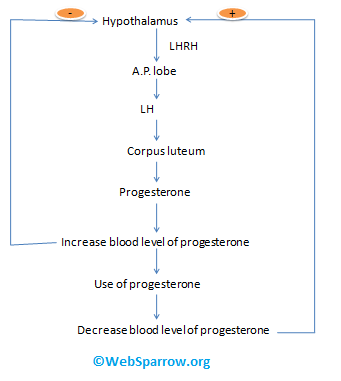 Progesterone is a gonadal hormone secreted from corpus luteum cell of ovarian follicle of female. It is steroidal in nature. Secretion of progesterone is controlled by LH (luteinizing hormone) of an anterior pituitary lobe of the pituitary gland. It involves the implantation of a fertilized ovum in endometrial cell. It also involves in the nourishment and protection of fertilized ovum. Helpful in the process of maturation of functional layer of endometrial cell of a uterus. Progesterone also helps in the development of mammary cell of the breast. It increases the body temperature. Progesterone is help in the maintenance of pregnancy after fertilized ovum. Immature endometrial cell cause amnerrheoea (absence of menstrual period) and dysmenorrhoea (painful menstrual). Enhance the ovulation process but ovum is immature. Cause unwanted retention of Na & H2O i.e. increase blood volume extracellular volume and cause hypertension and edema (swelling).